Join our amazing private tour of Capri Island from Sorrento, a very enjoyable experience in Italy. 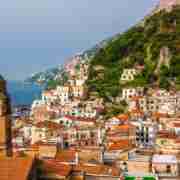 You will get to explore the splendid island of the Mediterranean, visiting all the beautiful attractions, like the town of Anacapri or the exceptional Blue Grotto (optional). Come with us and discover one of the most enchanting places on Earth and certainly a jewel of Italy, the pearl of the Mediterranean. This exclusive and private tour of Capri Island from Sorrento will completely inspire and fascinate everyone fortunate enough to participate. Whenever visiting the Italian coast, the island of Capri should not be overlooked, as it is truly a heaven for both nature and culture lovers, featuring exceptional views of the sea and the Naples Bay, but also amazing villages and sights that capture the hearts and imagination of travelers. The private tour of Capri and Anacapri starts from Sorrento, where you will take a hydrofoil to Capri Island. Here, you will meet our knowledgeable and passionate guide. Loved by both regular people and artists as well, Capri Island has served as an inspiration and a place to evade, a romantic destination with the most picturesque atmosphere one could imagine. Our private tour of Capri is definitely one of the top Italy experiences, exploring the past and present of an enchanting place. You get to visit Anacapri, the splendid town with plenty of things to admire and photograph, charming streets and parks, squares and monuments. Locations like San Stefano baroque church or the picturesque Certosa di San Giacomo will completely change your state of mind, creating beautiful memories. You will also may have the chance to visit the famous Blue Grotto, an outstanding natural wonder created in the rocky coast (weather permitting). A visit to the Blue Grotto sea cave (optional) will reveal a magical and romantic place, an extremely mysterious experience. You will also get to enjoy a nice walk in Capri village, admiring the laid-back and serene atmosphere of the island. The private tour of Capri and Anacapri will end with a transfer back to Sorrento. If you are interested in this special private tour but you are staying in Naples, don't worry! We have the same Tour of Capri departing from Naples... Contact us if you need further information! The price above refers to the minimum price per person, which will occur in the event of a group of 8 people. We recommend wearing comfortable clothes and shoes. In summer, remember to bring a hat and a bottle of water; in winter take along an umbrella. Visit to the Blue Grotto is NOT included. Anyway, you can visit it, once on the island. Please, keep in mind that there may be long waiting lines. In case of bad weather, the visit to the Blue Grotto may not be available.